History and local culture collide in Ollantaytambo. Pronounced in Spanish, the town’s name, “Oh-yahn-tai-tam-boh,” has a beautiful cadence. But it’s a mouthful of syllables, and locals often shorten the name to “Ollanta,” while English-speakers adopt the even briefer “Olly.” In the Sacred Valley town of Ollantaytambo, historical mystery combines with deep-rooted local culture to produce a place of true charisma. Located at a major point of transit between Cusco and Machu Picchu, the town is often overlooked in favor of more exciting destinations. But travelers who choose to stay and explore this historic place are rewarded with a unique view of small-town daily life in modern Peru. Ollantaytambo was one of many settlements conquered by Pachacutec, the 9th Inca king who commandeered the transformation of the Cusco Kingdom into the powerful Tawantinsuyu or Inca Empire. Under his reign, Ollantaytambo served as a pivotal outpost for Inca nobles and agrarian laborers. Upon his death, the estate remained under the control of his lineage in accordance with the land privileges reserved for Inca kings. In contrast to Machu Picchu, we have extensive written records about the history of Ollantaytambo in the years during and after the conquest. When the rebel leader Manco Inca escaped from Cusco, he established his headquarters here and it became the site of the infamous Battle of Ollantaytambo in 1537. Facing an incoming attack, Manco Inca ordered the building of a river dam to flood the valley and used the terraces as higher ground to defeat the Spanish soldiers. The Inca rebel forces eventually retreated further into the jungle, and Ollantaytambo fell firmly into the possession of the Spanish colonists. The town became a focal point for settlement in the Sacred Valley – first as anencomienda granted to Hernando Pizarro, brother of Conqueror Francisco Pizarro; and then as an important source of tribute and labor for the colonial state. (Encomiendas were parcels of land given to Spanish settlers. In feudal-like fashion, the grantee was entitled to the labor of native communities who resided therein, ostensibly in exchange for religious education and protection.) The town Ollantaytambo remained inhabited throughout this period of tumult. Today, its oldest pre-Columbian dwellings share space with Spanish colonial buildings and contemporary constructions. Together, they tell the story of a long, layered past. The architecture of Ollantaytambo is monumental. The layout of the urban sector includes two clearly differentiated areas: residential and administrative. Exquisite stonework is displayed alongside impressive agricultural technology that includes terraces, fountains, and irrigation canals that are still in use today. For both its urban and architectural design, Ollantaytambo is arguably one of the most sophisticated of Inca constructions. Based on the chronicles of the conquest and the site’s strategic position, scholars long believed that this place was a fortress for military defense. But the high quality of stonework suggests that it also served as a long-term resting place for royal families transiting through the Sacred Valley, possibly following the footpaths from Cusco to Machu Picchu. Ollantaytambo has three principal areas of interest: the town, the Temple of the Sun, and the terraces. 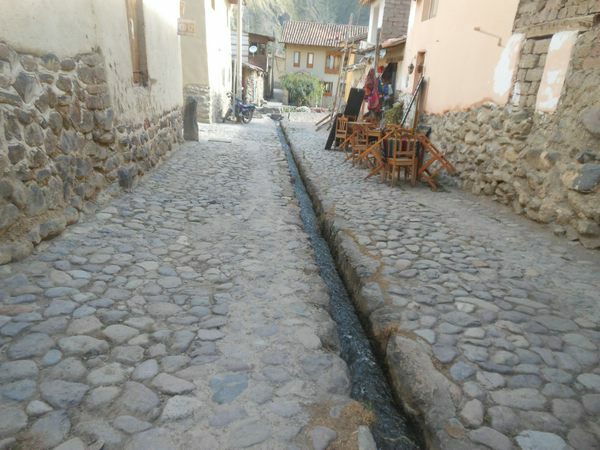 Water flows through the streets of Ollantaytambo since the days of the Inca. Ollantaytambo exhibits a highly organized distribution of space, with a grid design and a polygonal layout. The main square is at the center of the town, but its current total area is a fraction of its original size. The south and north sides of the town are quite distinct. The south is more polished with better stonework, while the north is generally in poor condition with lower quality architectural and urban-design work. Residential buildings follow similar patterns: a central courtyard, one-room buildings, walled compounds, and one or two public gathering spaces, known as canchas. On the west side of the town and across the Patacancha River, there is an adjacent construction known as Aracama, which features less impressive architecture, though it does include places worth visiting, such as the main plaza or Manyaraqui, the Catholic Church, the Temple of Water, and the Baño de la Ñusta. The precise fitting and monumental size of the Temple of the Sun at Ollantaytambo makes it unique among ruins in the Sacred Valley. The entire Aracama area is also known as “The Fortress.” The “Temple of the Sun” sits atop a pyramid of seventeen terraces that face the main square of Manyaraqui. Getting to the top presents a challenge because of the condition and quantity of the stone stairs. Allow 20 to 30 minutes to climb to the top. Caution is advised during rain storms as the stones may become slippery. The red porphyry rocks that comprised this temple are now mostly gone, taken to build the colonial town below, but the looting of stones has continued into recent times. Only six monoliths survive in place, but they tell the story of a structure that must have been magnificent. 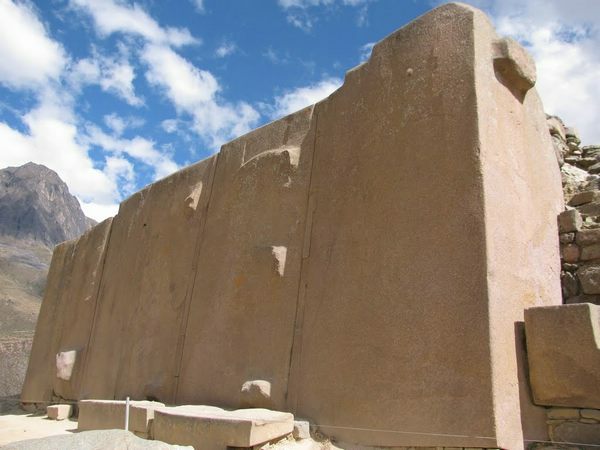 On top of the Temple of the Sun, there is another structure called the Inca Huatana, a flat wall with small niches several inches deep, apparently used for astronomical observation. The complementarity between the monoliths and the astronomic structure reinforce the idea that the site had spiritual and ritual functions. It is also believed that the construction of the Temple was interrupted by the arrival of Spanish conquerors and never finished. A distinctive feature of the Sacred Valley region is the ubiquitous presence of andenes (terraces). They are evidence that local populations mastered the challenging environmental and geographic conditions of the Andes to create productive lands. 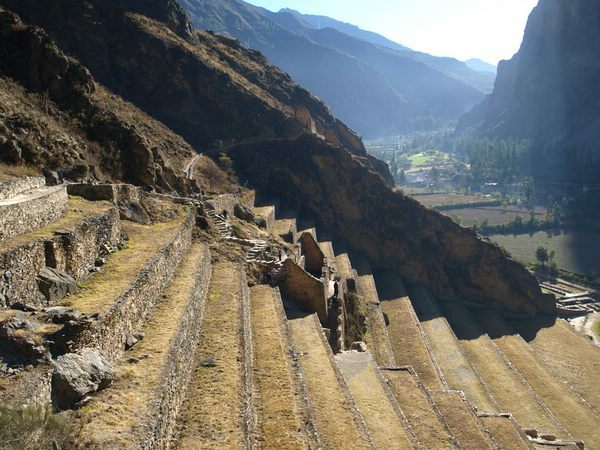 The andenes of Ollantaytambo are a marvelous achievement of early agrarian engineering. They are close to 2,300 feet long, 190 feet wide, and 50 feet deep. These terraces have high, polished stonewalls. The position of the structures relative to the sun and the slope of the hill allows them to absorb solar heat during the day and retain it at night when temperatures fall. This creates a microclimate that permits the growth of crops from lower altitudes. Terraces, called andenes in Spanish, adorn the steep sides of hills near Ollantaytambo. Ollantaytambo is an excellent base for exploration of other off-the-beaten path attractions: at Cachiccata hacienda travelers can visit the abandoned quarries from where stones were extracted. Directly across from the Temple of the Sun is Pinkuylluna hill, where a curious formation near the highest point resembles the face of a deity often called Viracocha or Tunupa. Hardy travelers may also scale the hill to obtain sublime views over the valley. Hike or catch a ride to Pumamarka, a smaller urban site that allegedly dates back to pre-Inca times. You can also visit the gorgeous Yanacocha lagoon, the main source of water for Ollantaytambo and the larger valley area, from where Incas built much of their hydraulic infrastructure. Two roads connect Ollantaytambo to Cusco city. The shorter route (Route 3S) is through Chinchero and across a high plateau; the second (Route 28B) is through Pisac and the Sacred Valley. Both roads connect in Urubamba and continue on a single road to Ollantaytambo. Weather and road conditions permitting, a direct transfer between Cusco and Ollantaytambo is approximately 1.5 hours in duration. Buses and taxis (private and shared) serve the route. Twenty-five additional miles separate Ollantaytambo from Machu Picchu. There is no direct road to Machu Picchu, only rail. A good way to organize a Machu Picchu itinerary is to arrive to Cusco, take a bus or taxi to Ollantaytambo, spend the night there (or in Urubamba), and then take a train to Machu Picchu. For overnight stays, Urubamba and Ollantaytambo offer the full range of accommodations, from basic hostels to luxury resorts, and everything in between.